Hello there and well done to everyone, you have certainly been a busy bunch. Sharky, I admire your ambition to take part in Ergomania and the CRASH-Bs 2020. Plucky lady. 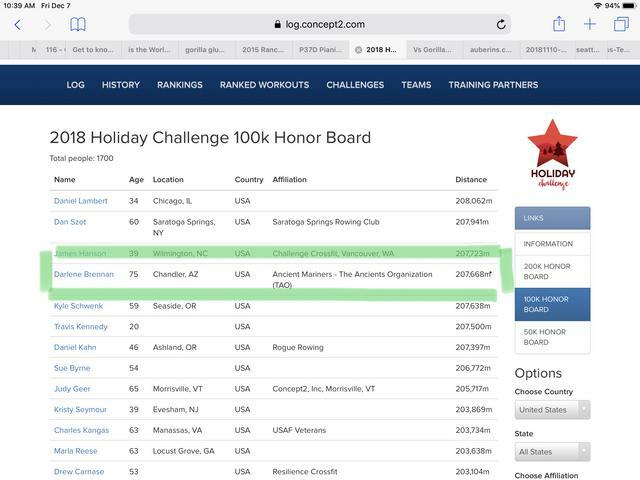 Apart from keeping up your meterage, which you are already achieving with great success for the Holiday Challenge, have you actually worked out a training plan for a particular distance or distances? Janet, I love your enthusiasm and congratulations on your PB - when I looked earlier, you only had just under 3,000m to go in order to hit the halfway mark for the 100,000m. Occowboy, in all likelihood you will have already reached 100,000m and be well on your way towards 200,000m and your 2,000,000m target for the year. Like Sharky, I reached the 100,000m level today which was my aim, so I’m pleased with that. Although i have worked out a schedule for the next 100,000m, which has me finishing no later than the 17th, things might not go according to plan. I have made the mistake ( if you can call it that ) of checking out the Luna-tics forum. What wonderful graphics, including reindeer with their antlers adorned with flashing fairy lights. Ooooh! … Too much … It’s enough to turn a girl’s head. Keep all lit up yourselves as you flash through the metres. Jill and Sharky, great job getting to 100,000 already! I had high hopes of doing 200,000, but I am just going to see how it goes. We arrived safely in florida after 2 days of driving from Michigan. Have to put rower back together yet, but we were busy fishing already. I did run/walk today though . I do need to get some serious biking in before our Thailand trip and keep up with my triathlon training, so there are some things competing for my fitness time. When you are retired and living in the florida keys, you have nothing but time though, right?? Planning to set up the erg in our bedroom by the sliders with a nice view of our canal and palm trees, so that should be motivating! I'll touch base when I get close to or over that 100,000 mark . Keep up the good work everyone. P.S. JIll, I have seen the Lunatics reindeer as well...cute idea although scores and competition get me going more than flashy lights and cute critters . Janet, Glad you made it safe, and I'm sure you'll be back rowing in no time. And good luck with the triathlon training as well. Jill, first, congrats on completing the 100K! Training? Just going to do a 2K. Based on the results of previous years (Ergomania or CRASH-Bs) I'll be off the winners pace by at least 2 minutes. In my original post, I choose the verb 'participate' deliberately, since I know I won't be competitive. I'm OK with that. I'm a slugger, not a speedster. I'll work on improving, but basically I just want to be able to say I did it. Thanks, Jill. I'm at 147,000 M so far so the 200,000 for the HC is doable. Not so sure about 2M for the year though. I've been planning it out but not sure I'll hit it before the year ends with the holidays (and my baby will be home for a week). The goal is good but some days just the thought of rowing holds less appeal then poking myself in the eye. With that said I'm trying to figure out how Don has 1.8M meters in the HC. My legs would be falling off. I've made it to 56,000 meters, but I am struggling to even get in a 30 min row for the CTC at any decent time (aiming for 2:22 or so). Am I just expecting too much for a newbie (only been rowing about 6 weeks counting the 2 weeks I missed on vacation)? I feel like I could easily do the 30 min straight if I wasn't rowing hard (anything over 100 watts at this point), but if I try to do a proper stroke with a good leg push my heart rate is pretty high and I've had enough at 15 min. I did about 3 or 4 attempts today, so I totaled around 8000 meters, but just couldn't mentally put together a long row. Any suggestions as to whether it is best to do shorter, hard rows and gradually add time or do easier, longer rows and gradually improve watts (faster and higher drag perhaps)? I don't mind doing multiple rows per day except for the fact that I sweat like crazy, so that requires multiple showers per day and lots of laundry LOL. You ladies are doing amazing thus far. I am assuming most have been rowing awhile and have built up the endurance, but impressive nonetheless! Janet, I'm not an expert but my $0.02 would be to ease up on the pace and get used to the time. Longer efforts are as much mental as physical (IMHO). My advice would be to set an easy pace and complete the 30 minutes, then start working on improving your effort. Right now, my shortest row is about 20 minutes, and my longer rows go about 35-40 minutes (about a quarter of football ), my pace is about 3:10. 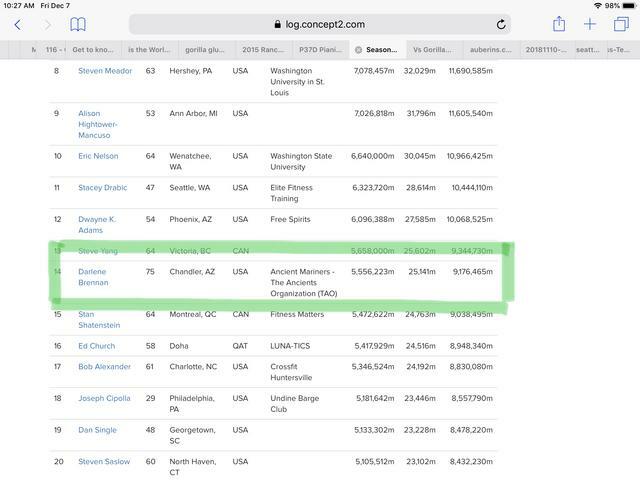 I checked the rankings for 30 minute row for women in your age group and right now the 50 % mark is a 2:25.2 pace, which is lower than what you are targeting. For a new rower that's really good (IMHO). He is a marine (former, I assume) who has the adaptive profile that matches a leg amputated above knee and not using a prosthetic for rowing. I found an article online about a group helping vets that said he was basically a recluse until he discovered rowing. He only came out of his room to row 3 times per day. I still don't know how mathematically he could have 1.8 meters in 2 weeks, but it really makes me think I have no reason not to be able to easily make 200,000 meters for the holiday challenge! Janet FWIW I reckon you should back off the pace and concentrate on time and a steady stroke. 100W is close to 2W/kg which is a good goal but takes time and probably ambitious to start with. Training hard and racing all the time is unproductive - take it easy. You could also try say 3x 10'/2'R to break it up a little. He is a marine (former, I assume) who has the adaptive profile that matches a leg amputated above knee and not using a prosthetic for rowing. I found an article online about a group helping vets that said he was basically a recluse until he discovered rowing. One of the most inspiring things you can ever see is the Indoor Rowing at the Invictus Games -- was in Sydney recently and not "only" single amputees but even triple amputees and paraplegics doing amazing things. It is astounding and I will never complain about a training session again. Thanks for your input Lindsay. I did manage to complete the 30 min today for the CTC at 6053 meters with two 20 second rests during the 30 min, so my meters would have been better without those. Averaged around 100 watts (some intervals better...some worse). I also jogged and did a 5 mile bike today, so hopefully I will do better on fresh legs and after some practice throughout the month. Harder effort than I would like for 30 min. (HR was cranking), but now that I have an entry in, I will ease up and try to do some slow/easy ones and build up some endurance. Had drag at 110. Too modest by 6.7 watts! Old snowontheroof longinthetooth shortofwind jack knows his way around tooth hurty pace pretty well and 6k in 30’ is 104+ watts at a glance. Now if those 20” breaks weren’t counted in the total time to complete and we took your time as 29’ 20”, that’d be 114+ watts average power and 2:25/500m pace. So you’re doing well but working a bit above your sustainable 30’ pace. Concur with Sharky and Lindsay’s thinking about getting strong long rather than fast short. Think continuous time or distance rather than intervals when so stipulated. When you conquer the hour and the half marathon and begin to contemplate the FM, most folks (by no means everyone!) will consider 2’ water stops acceptable. But on 30’? No. Maybe a soft stroke here and there but not multiple stops of 20”. Still keeping up with my schedule. I pulled a muscle or rib last Sat in my left pectoral area so I've had to keep my efforts light and make up for it with a bit longer rows. Janet, congrats on doing a 30' row! There's still a lot of month left. I've never done the CTC stuff, but a 30' row is in my wheelhouse so I may put an entry in. Hope you heal up quickly Sharky! Wow...that Darlene woman is impressive! Hope I am still rowing at 75 . I am chipping away slowly...at just over 70,000 for the holiday challenge.